The sun is out and spring is blooming. Easter is almost here. Are you ready for the upcoming holiday? I am not ready. I need to get organized because it will be here before we know it. How stinkin cute is that card. Love it! Those bunnies are adorable! Love the spring colors used. A gorgeous Easter Card! Very cute image! Thanks for joining us at Creative Inspirations Wednesday's Challenge! What an adorable image...thanks for joining us at ABC DT Challenge. 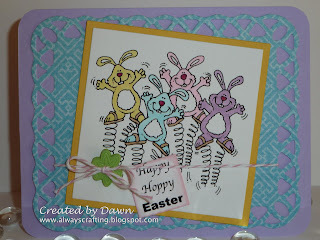 Oh what fun springy bunnies! Love the colors too. Thanks for joining us at the Creative Belli Challenge. too fun of a card! Love it. Thanks for playing alongon For Fun. What a cute little action card- love the bunnies bouncing on the spring- fun! Thanks for joining us at the Belli challenge.